The Design Thinking process cannot be done without prototyping and testing. However, for companies or teams unfamiliar with the Design Thinking method, there might be some common mindsets about prototyping that potentially undermine its effectiveness in helping you craft the optimal design solutions. Let’s look at six of the most common misconceptions about prototyping, and how to combat each so that you can avoid these pitfalls and build better products or services. If you were not (or if your team is not) familiar with Design Thinking, you might have some ideas about prototyping — what it’s meant for, when it should be done, etc. — that are actually counter-productive to the process. Thankfully, we have listed below six of the most common misconceptions or incorrect mindsets, as well as solutions to each to help you reframe your mindset or rethink your process. Let’s get started! It’s attractive to want to grab at the first glimmer of light you see and run with that as your final solution. This is often inspired by a senior manager, not necessarily involved in the process of prototyping or ideation, who might not have enough understanding of how it works. Often, teams try to save time and move headlong into implementing their very first promising idea. This leads to an issue, because most problems we are trying to solve are more complex than they look on the surface. The way people behave, constraints in the environment, and a thousand other factors might cause matters to turn out differently from your or your team’s expectations. A promising idea, pushed all the way into a fully formed solution without any prototyping or validation, may turn out to have a couple of assumptions wrong (if you are lucky). The result is a solution that doesn’t work, and lots of time and energy wasted. One of the keys of successful prototyping is working through a number of models and exploring different approaches, before finally including the best characteristics and removing the problematic ones for the final solution. Test out many ideas. Test them by building prototypes — no matter how rough and simple — and test them on team-mates, internal stakeholders, and users. Test many alternatives even within one idea, explore variety, and don’t discount possibilities until you’ve tested them. Most times, you will be inspired to create more ideas, or merge a few solutions into a better and more successful one, by testing alternative ideas and making quick and dirty prototypes. The endowment effect, otherwise referred to as “investment bias”, can interfere significantly with the value derived from prototyping. 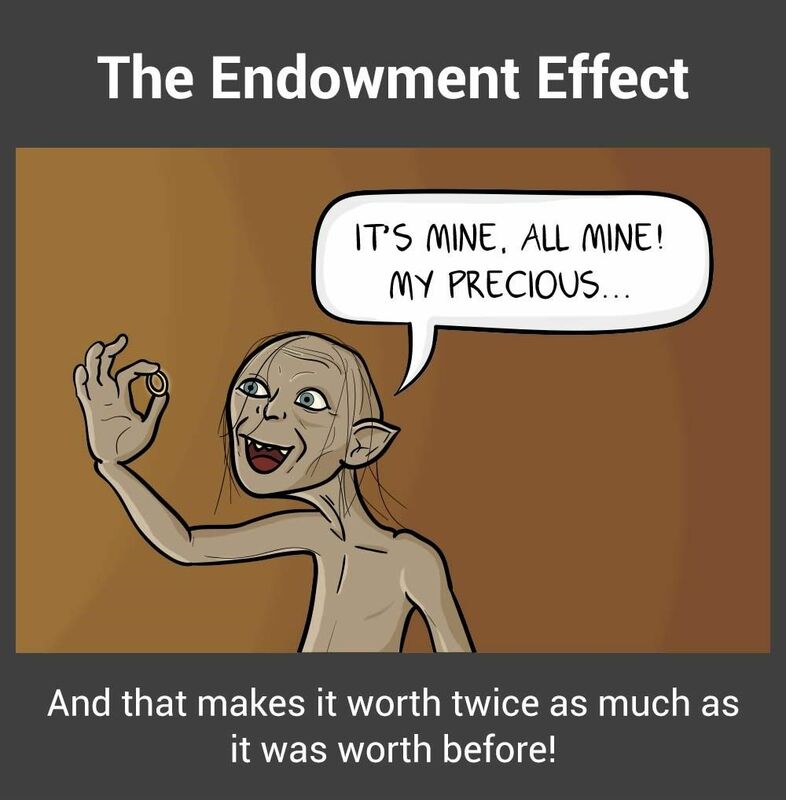 The endowment effect happens when people ascribe more value to an object simply because they have ownership over it. In prototypes, the endowment effect can create the dangerous situation wherein prototypes become too “precious” to fail or give up on. This is when the creators of a prototype becomes overly invested in their creation, resulting in their overlooking of faults and insistence on implementing the current model due to the amount of time, effort or resources invested in creating the model. It can happen when designers become too emotional about prototypes or ideas that they have conceived, even when it becomes clear that the ideas are problematic. This usually happens when designers spend too much time creating and perfecting a prototype, when a rough and dirty model would suffice. Additionally, executing early prototypes at too high a fidelity may result in this kind of bias. If we were to do this with a prototype, the effort we’d put into making it as realistic and looking as refined as possible (without reckoning on refining the actual faults in it) might help us dupe ourselves into believing we’d landed on a miracle discovery—a winner that would be sure to resonate with users. Usually, low-fidelity prototypes, such as paper mock-ups or sketches, are sufficient for early stage testing. Only towards the end of the project do you need to create higher-fidelity prototypes that require more energy and time investment. Avoid the endowment effect by creating quick, low-fidelity prototypes using cheap materials. Start simple. Make quick and fast prototypes. Make use of low cost, readily available materials in early-stage, low-fidelity prototypes. Always make sure that your prototype has just the level of detail required for what you are testing for, never too much. This would prevent you or your team-mates from becoming too attached to a prototype. Also, be prepared to break, completely destroy or throw those models away once the questions they pose are answered. You can achieve this mentality by using low-cost materials in your prototypes. Test out a number of ideas and models as rapidly as possible in order to avoid becoming anchored to one stream of thought. Having an expendable prototype is a million times better than having an expendable concept—i.e., one that won’t latch with anyone, least of all your usership, no matter how fancy the model of it looks. Another problem you should avoid is spending too much time pitching and explaining ideas — and too little time making things and figuring out issues with and challenges to your ideas. This results in a theoretical focus and could lead to moving forward with ideas that you will not have tested. Show; don’t tell. To explain how a solution works, create a model and show how it will work. If you are unable to show it working, you may find there are holes in the idea — and that’s a learning opportunity right there! Embrace the bias towards action mindset by opting to show the value of the ideas instead of telling everyone how great your combination of these notions will be. When you build simple prototypes to show what your ideas are, you also make them much easier to understand and allow others to build on them. Illustrate what you want to explain physically. It’s the best way to know whether you’re on to something or not. For instance, when IDEO was approached by Gyrus ACMI, a medical visualisation and energy systems company, the team met with specialist surgeons so as to understand their needs better. After one of the surgeons explained (or tried to explain) how their surgical instrument could be improved, an IDEO designer immediately created a rough prototype of the idea. The team was able to understand instantly what the surgeon meant, and the discussion was brought forward, thereby saving the team many more meetings. Prototype to show, because showing is much more productive than telling. Rushing a promising idea into a solution is a bad idea, but creating prototypes without a purpose is equally bad. Prototypes exist for a reason: to test and validate assumptions, test our ideas for solutions, or explain and flesh out ideas. Prototyping for the sake of prototyping can result in a lack of focus, or prototypes with too much detail (i.e., a waste of time) or too little detail (i.e., ineffective in tests). Before you create a prototype, ask yourself, “Why am I creating this prototype?” Make sure you have a central purpose (i.e., to test my assumption X, or to test the usability of my solution, etc. ), and then build your prototype to match that purpose. For instance, if you need to test your assumption that your users will not be willing to use a piece of equipment heavier than 2 kg, then you might not even need to create a functional prototype. Simply create a prototype that weighs below 2 kg, and another that weighs above 2kg, and test both on users. You’ll save time by creating prototypes at the right level of fidelity, and still be able to learn exactly what you want to learn. When prototyping, you might feel a sense of failure at times. This is because the steps involved in prototyping might fall into what we generally label as “failure”, especially when tests reveal your false assumptions. However, being disillusioned when your ideas don’t work out can cause a negative state of mind and inhibit progress. The point of prototyping is to ensure ideas will work and to validate the assumptions made when conceptualising the ideas. To be productive when prototyping, we should unlearn what we are taught about failure. When doing Design Thinking, you should embrace the right kind of failure. Failure provides massive learning opportunities, which will eventually lead to new insights and eventual success. – Thomas A. Edison, American inventor who developed the motion picture camera and the electric light bulb. Reframe the idea of failure in prototype testing into a learning mentality. Remind yourself that wrong ideas and failed prototypes allow you to learn more than successful tests and prototypes do. Embrace the principles of learn methodology by working validation into every decision that you make or have a hand in making. Validation reframes the concept of failure and makes it part of the process of learning instead of being a destructive influence. When you think of prototypes and tests as learning opportunities, you set yourself up for a kind of positive failure that leads to a new, more informed experiment. The truth is the opposite. Although we might spend time when we build prototypes, they actually allow us to move faster in the long term. It’s because, through prototyping, we are able to see whether our ideas would work out, and be able to refine or tweak them further… or abandon them when we’ve realised that what seemed good on paper won’t hold water in the sea of harsh reality and unforgiving consumers. In the long term, we will be able to reach the ideal solution faster. Prototyping is crucial in every Design Thinking project. However, there are pitfalls that could undermine your efforts to let prototypes work for your team. Specifically, you have six of these to avoid, everything from becoming discouraged by the insight-giving nature of failed prototypes to putting inordinate amounts of effort into your first prototype and clinging to it because it seems infallible. Learn to embrace the idea of constantly and rapidly prototyping, and make sure you have the right mindset when making prototypes. The old saying goes that nothing is more powerful than an idea whose time has come. That may seem all very well, but a series of prototypes will bring such an idea into the real world where people can make it truly powerful.